Modern Roller Blinds Offer a Dazzling Array of Features. Our most popular interior blind is the Roller Blind, otherwise known as a Holland Blind. They are stylish, practical, low maintenance, affordable and come with a range of options that can take it from a basic blind for a rental property to a feature in a high-end luxe apartment. With a variety of sheer or blockout fabrics, textures and colours to suit any room, Roller Blinds are an elegant yet subtle window treatment. Ideal for main living areas, bedrooms, kitchens and bathrooms, you’ll often find a whole home displaying roller blinds as the main window covering with different fabrics, pelmets or control options to highlight main living areas. In particular, we love the look of roller blinds that use Somfy motorisation, a modern pelmet and incorporating wide width, high-end screen fabrics, which sit neatly over large windows or sliding doors in modern living areas. Roller Blinds are commonly combined with Curtains and Roman Blinds to create a highly flexible window covering with the soft lines of the latest fashion. Stan Bond uses high-quality components from three of the world’s best system designers – Rollease Acmeda, Sunboss and local South Australian design company Ziptrak. By combining these three systems, we provide solutions in difficult scenarios that would challenge many other companies. For example, the Ziptrak Interior spring operated blackout system – designed for areas that require full blackout, such as home theatres or the bedrooms of shift workers. Visit our display centre to explore the huge range of Roller Blind options, or talk to one of our consultants about finding the right Roller Blinds for your home today. Don’t forget, if you are building a new home, bring in your plans so we can help find the perfect solution. The latest in Roller Blind technology is the Somfy and Automate motorisation ranges, which include iPhone and Android apps to control your blinds remotely. Come into our display centre for a demonstration of these leading technologies. Grey tone fabrics with metal bottom rails and metal chains are currently very popular. Adding a white sunscreen fabric behind the blockout (which makes it a dual or combo blind) gives you privacy and glare control during the day, then lower the block out blind in the evening to darken the room. As Adelaide’s largest manufacturer of Blinds, Awnings and Crimsafe Security, we can offer you the widest range of fabrics, options and colours. Choose from a range of Australian Made or globally-sourced blockout fabrics to manage sunlight, reduce heat build-up in your room and provide privacy in bedroom and bathroom areas. Sunscreen or sheer fabrics can block up to 99% of sun glare, while allowing natural light into your room – providing daytime privacy, while allowing you to see out into the world. 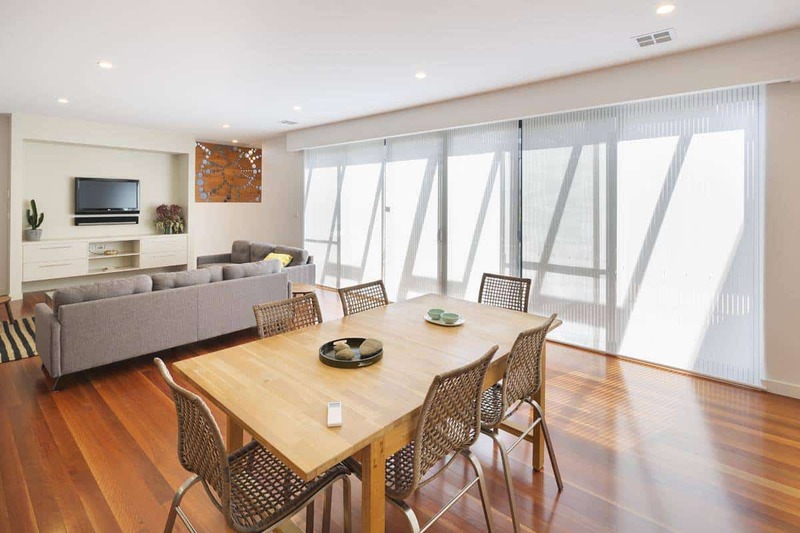 Translucent or light-filtering Roller Blind fabrics are less commonly used in Australia, but can be ideal for living rooms and entertaining areas that require natural light and higher levels of privacy than a sunscreen fabric can provide. Choose from a range of colours, patterns and textures, with both subtle and strong finishes, or select fabrics with fire retardant, environmentally friendly or easy clean coatings. By combining two Roller Blinds on a double bracket, these dual-purpose blinds let you individually operate a block out blind and a lighter translucent blind to improve light control, privacy, and insulation. Sunscreen fabrics are often used in combination with a blockout fabric for a flexible and affordable window covering solution. Ziptrak Interior is a revolutionary advance for interior blinds. Developed after years of research and development by local system designer Ziptrak®, this system takes cues from the hugely popular Ziptrak® Exterior to create a sleek track guided system that is incredibly simple to use. No other Interior Blind blocks out light better than Ziptrak® Interior. The track guided system secures the blind material within vertical side tracks, preventing light from entering through gaps. An enclosed pelmet at the top provides a seal, preventing both air and light from escaping as easily as a standard roller blind. Quickly transform your home cinema, living or media room into a lightproof space, ready for a spontaneous movie afternoon! As an exclusive manufacturer and distributor of the Ziptrak® Interior and Exterior blind, Stan Bond can offer you many more options to help you live comfortably. All of our Roller Blinds are custom made to your onsite requirements. Stan Bond does not offer any cheap and nasty pre-packaged or cut down blinds. Instead, we produce each blind to exactly fit the dimensions and needs of your window. Pelmets are the finishing touch to your Roller Blinds. Stan Bond can offer a range of modern pelmet options – whether it be a streamlined aluminium design, a custom painted timber pelmet, a fabric covered timber pelmet or a more basic valance pelmet to be covered with your choice of fabric. 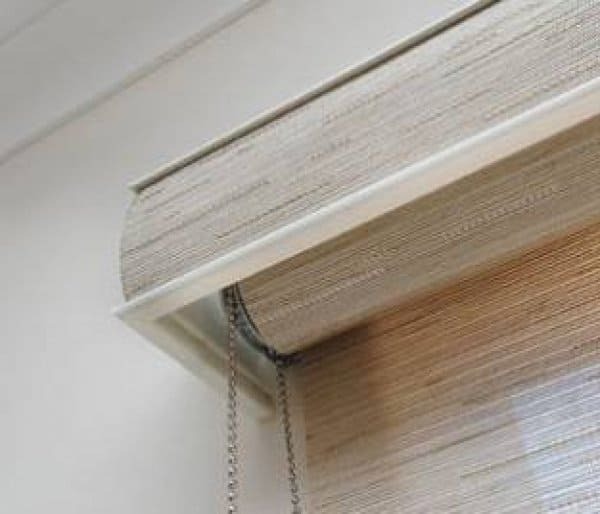 Pelmets were once considered old-fashioned dust collectors, but now the modern options can complement a minimalist style home and cover the working components of the blind. Stan Bond offers commercial grade Roller Blind systems that can be made as wide as 4.5m with either a chain or motorised control. Using components as large a 63mm, we can span large architectural windows that many of our competitors cannot. Wide areas can also be linked together, allowing multiple blinds to raise and lower using a single controller and reducing the gap between each blind. As accredited Somfy Motorisation experts, Stan Bond can provide all manner of motorisation solutions – whether it is for a single difficult to access window, or a whole home controlled by a building management system. Ideal for a variety of applications, for both residential and commercial properties, remote controlled blinds allow you to effortlessly control your internal blinds and regulate light and temperature with ease. The addition of motorisation to your interior blinds lets you raise and lower your blinds based on weather conditions, sunlight and heat all from afar. This automation makes your home less vulnerable to burglars, who will look for unoccupied, easy targets. Head to our motorisation page to learn more. By law, we are required to ensure that any installation complies with regulations relating to child safety. This means that cords which fall below 1600mm from the floor must be secured to the wall with a child safety restraint device. If this doesn’t suit your circumstances, consider a spring operated or motorised option to remove the need for a chain altogether. Q: WHAT IS THE DIFFERENCE BETWEEN A ROLLER BLIND AND A HOLLAND BLIND? A Roller Blind is an internal blind with a tube at the top which fabric wraps around going up and down to block off a window. Traditionally a Roller Blind has been a chain operated blind whereas a Holland has been the same type of product but with a spring operation. Nowadays most companies call them Roller Blinds. Q: WHERE ARE THE BLINDS MADE? Our Blinds are made in Adelaide. We have owned and operate our manufacturing plant in Newton, South Australia since 1980 and the company employs over 70 Adelaide staff. We manufacture over 98% of the products we sell with only a couple of niche exceptions. Stan Bond is SA’s largest manufacturer of Blinds, Awnings & Security products. Q: CAN YOU USE ROLLER BLINDS OVER SLIDING DOORS? Roller Blinds on Sliding Doors are becoming more common. It is possible to install them this way but there are a few things to consider. The blinds often have to fit on the face of the door frame as there may not be enough space in the reveal due to the large handle or sliding door framework. We offer a service of cutting the sliding mullion when there is not quite enough room. Most companies do not offer this service so discuss it with the consultant when onsite. Also, consider where you will have the controls – often on standard sliding door set (1 door and 1 fixed panel) you will have two blinds split in the middle. When it is a centre opening sliding doors (1 door and 2 fixed panels) you may need to consider motorisation or easylink to avoid a chain hanging in the middle of the opening. Q: DO YOU SELL DAY NIGHT ROLLER BLINDS? Day Night Blinds or Day & Night dual blinds are another name for Combo blinds. They are two roller blinds on one bracket with most often an open screen fabric on one Blind and a Blockout fabric on another. The screen blind allows daytime privacy, some heat/cold insulation and glare protection while the blockout blind provides nighttime privacy, light control and protection from the hot sun. Q: WHAT ARE THE CHILD SAFETY REQUIREMENTS ON BLINDS? There are laws in place to protect children from accidental injury on blind & curtain chains. Any chain or cord hanging lower than 1600mm from the floor must be restrained so a child’s head cannot fit through any loop formed. We cannot install blinds in a manner that contravenes the law even if the owner of the residence requests an exception. Roller Blinds and Holland Blinds are currently our most popular window covering especially when custom made as a combo or double roller. This gives both a privacy blind and a block out fabric blind. Q: HOW DO YOU TELL THE DIFFERENCE BETWEEN A QUALITY BLIND AND A CHEAP? Quality Roller Blinds can often be identified by the use of quality components. Ask whether the blind use Acmeda or Sunboss components. If it is not these two systems you’re getting a lesser quality product. Also, well made custom blinds generally use 43mm or 45mm top roller tubes. The bigger the tube the strong the blind is over wide openings and the better the blind rolls up and down. The price of a roller blind is a good indication of quality; cheap fabric and components generally have a poorer life and are harder to clean. Q: HOW DO I BUY CUSTOM ROLLER BLINDS? Give us a call to arrange a consultant to come to your home and show you the range of options and fabrics. This is a free service and ensures you get a quote for the product and price which will suit your home. Once you are happy with the measurements, fabric choice and price the consultant will send the details of the order to our manufacturing plant in Newton, SA to have the blinds custom manufactured.